Food Hunter's Guide to Cuisine: Lemon Honey Cookies & A Raw Honey Giveaway! Lemon Honey Cookies & A Raw Honey Giveaway! Oh honey, how I love thee. I’m referring to raw honey to be exact. Honey has so many uses and raw honey in particular provides incredible health-benefits. From curing a sore throat or cough to soothing your skin, it has been used throughout history for many purposes. My favorite (of course) is the use of raw honey as a sweetener. Add it to salad dressings, beverages, toast, drizzled on fruit, chicken wings…you name it. Note, If you are planning to use honey for its health-benefits, it must be raw honey. Heating honey (pasteurization) destroys the all of the pollen, enzymes, propolis, vitamins, amino acids, antioxidants, and aromatics. The rawest honey available is comb honey (sections of the hexagonal-shaped beeswax cells of the honeycomb that contain raw honey that have been cut from the wooden frames of a beehive), however most people prefer bottled raw honey. I recently had the opportunity to try two different varietals of honey from Mohawk Valley Trading Company, including their Apple Blossom Honey and Buckwheat Honey. The Apple Blossom is derived primarily from the nectar of Fuji, Wolf River, Crispen, Sweet Sixteen, Pound Sweet, Granny Smith, Winesap, Fortune, Cortland, Empire, Ginger Gold, Macoun, Spigold, Honeycrisp, Jonagold, Golden Delicious, Acey Mac, and other apple blossoms in the Southern Kuyahoora (West Canada) Valley and other regions of Upstate New York. As you can imagine this variety of blossoms, gives it a deliciously unique flavor. The Buckwheat Honey is from hives in buckwheat fields on both slopes and the surrounding area of the Central Mohawk Valley and the Finger Lakes region of New York. This honey has a deep, dark brown color, with a strong molasses like flavor. It paired perfectly with balsamic vinegar for a wonderful salad dressing. I try to steer clear of processed sugars, so I’m always looking for ways to substitute sugar with more natural sweeteners. 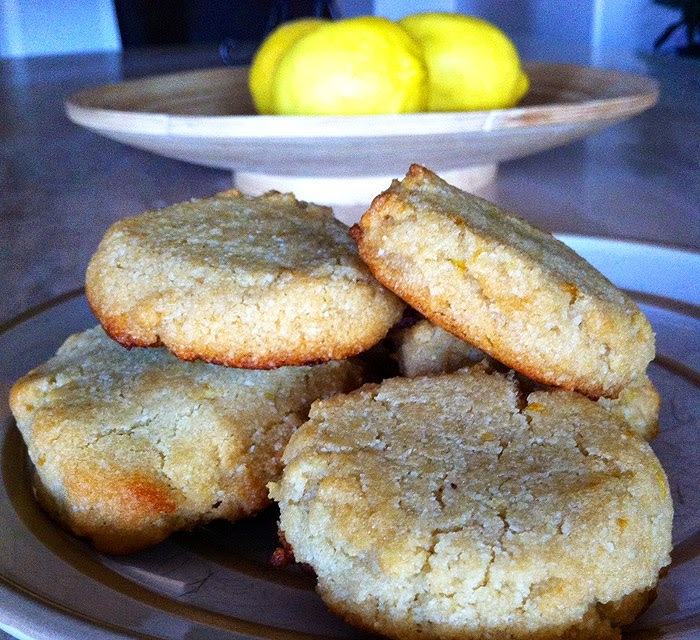 The Apple Blossom Honey worked perfectly in these delectable lemon cookies. This “healthy cookie” is the perfect combination of soft, chewy, sweet and savory. My guilt-free, go-to cookie! Enter below for a chance to win two jars of Mohawk Valley Honey. Cant to wait to see if you won? Receive a 15% discount on all Mohawk Valley Trading Company Honey, Maple Syrup, 100% Pure Beeswax Candles, Handmade Soap and Natural Skin Care Products and from 6/2/14 through 6/16/14 with the Coupon Code “Food Hunter’s Honey Giveaway”. a Rafflecopter giveaway In order for me to support my knowledge-sharing/writing/blogging activities, I occasionally may receive monetary compensation and or product in exchange for my recommendation, and/or testimonial. However, I only recommend products or services I have personally used myself and trust. These lemon honey cookies look incredible! Love raw honey! Raw honey all the way! I've preferred maple syrup, but now I'm going to try raw honey! I love lemon and honey together. It's the perfect combo. Love these cookies so much. I love maple syrup, but raw honey on pancakes would be awesome! I prefer honey rather than sweetener...and these cookies look great! I prefer raw honey. So so good. Makes the best homemade honey taffy as well! I like using raw honey, especially in my tea. usually honey, its more versatile. These cookies look terrific. Three out of four of my kids have food allergies/issues, so I love the dairy & gluten free recipe! I also love to use raw honey drizzled over homemade gluten & dairy free cornbread!! I put some lemon in my sugar cookies the other day - YES! Definitely will be doing that again! I love this recipe! I'm big on lemon anything but the addition of the honey is totally drawing me in! I love the thickness and color of these cookies. They sound incredible!!! They look so moist! My son is gluten-free and we're alsways on the lookout for good cookies. I just bought coconut flour and almond flour. I have all the ingredients to make these. They look delish! I like both sweeteners but have been using more honey for the health benefits. Thanks for the chance to win! I can not wait to make these!!!! I usually prefer honey, but I like to make granola with maple syrup. These cookies sound delicious and I bet they have a great taste between the raw honey and almond flour. My choice is for honey, I love the stuff, using it in my morning oatmeal and at lunch everyday. I like syrup too, but use it only with pancakes, waffles and French toast. My family prefers raw honey, though I have tried a few recipes with maple syrup and they were pretty good. I use stevia as a sweetener but raw honey is great for medicinal uses! Depends on what I'm baking but raw honey would probably be my favorite! For me, it depends what it is...for my husband, he'll put honey in anything! Raw honey is my go to for everything! I like both, but it depends on what I'm using it for. raw honey all the way! I love the health benefits. I use honey more often. Good TRUE maple syrup is kinda spendy, so I save it for uses when you really get to taste the flavor. It all depends. I feel like I can blend honey into more savory dishes easier and use maple syrup for beverages and baking. But I can eat both off a spoon any day :) I try to keep a rather large supply of both. I usually use raw honey to sweeten things - I love the taste!